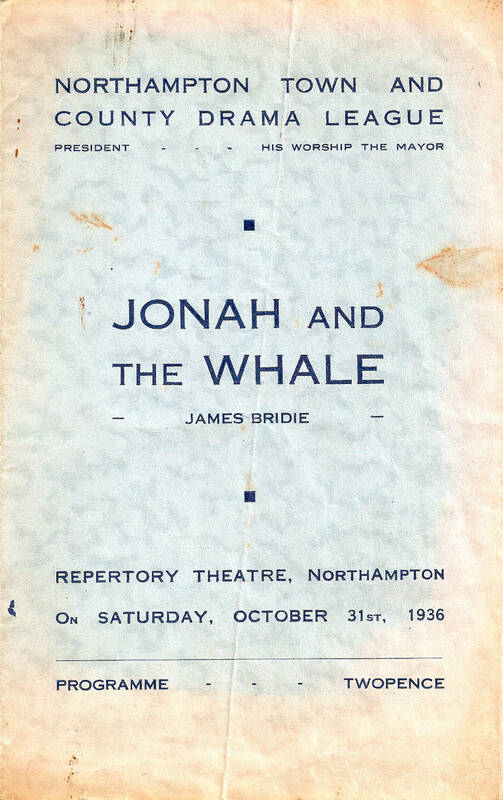 Jonah and the Whale was presented at the Royal Theatre, Northampton (then known as the Northampton Rep) for a single matinee performance. At that time, scenery and props were stored in the premises in Swan Yard, not far from what later became St John's multi-storey car park. These were moved to the Rep on a handcart following the professional company's Friday evening performance. The Jonah set was put up and after the show was immediately struck in time for the Rep to do their two performances in the evening. The writer, James Bridie, was the pen name of the Scottish surgeon Osborne Henry Mavor. He became a full-time writer in 1938 and went on to found the Citizens Theatre in Glasgow and helped establish the Edinburgh Festival. In the 1940s, he worked on three screenplays for Alfred Hitchcock.